I was let down by Out of the Shadows. This film had almost everything in place to become a great entry into this franchise. 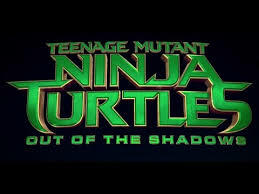 The film focuses more on the turtles this time around, leaving the human characters as supporting characters. The first film focused way too much on April and here meeting the turtles. This would have been fine if they had done what the 1990 film did, but the 2014 film spent a lot of time with the humans and not with the titular characters. This film did that and gave us more characters this time out. We finally got Bebop and Rocksteady. This was major as the fans have been asking for them since the 1990s. The characters are nicely played and give the fans what we asked for. 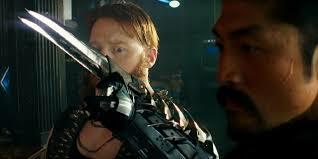 We also get a real Shredder and not the fake Shredder like the last film tried to pawn on us. We also get Karai (she doesn’t do anything, so why have her? I don’t even think that her name is said. ), Baxter Stockman, and Krang. Hell, we even get the Technodrome. But for all that we get, we also have to suffer through a really boring film. There is a lot of action, but there is very little martial arts. You would think with a film called Teenage Mutant Ninja Turtles, we would get some kickass martial arts sequences, but no. We get some kicks and punches thrown, but nothing in the way of actual martial arts. There is a big subplot in the film about how the ooze can turn the turtles human if made in a certain way. The turtles fight about whether they should use it and become “normal”, so they can go up to the surface and experience things a human can. They argue and then resolve it with much to do about nothing. I t would have been cool to see the four as humans; to see how they would have interacted with the world. That is too much thinking for a Michael Bay produced film. There has to be an action scene or explosion every ten minutes and that would have produced none of that. -The Shredder is used a little more than Karai and that is being nice. The filmmakers clearly didn’t know what to do with him and banish him early on as soon as he helps Krang. -In a world of social media and everyone having a camera, not one person gets a shot of the turtles. In fact, I don’t think that they bring up social media at all. Kind of weird for a film that contains a lot of technology. -The filmmakers seemed to way to fix things that the 2014 film did wrong, but they don’t replace Tony Shalhoub as the voice of Splinter. True, the character is hardly in the film, but Shalhoub’s voice does not go with this version of Splinter. They should have gotten a different voice actor or redone that way that Splinter looks to suit the voice better. -The film is two hour long. This film should have been no more that hour and forty-five minutes tops. The film runs way too long for the story that they are trying to tell. Drop the subplot with the ooze (that goes nowhere) and some other things and the film would have been a much better experience. -The characterizations of Rocksteady and Bebop are really nice. The actors are game and they are one of the highlights of the film. 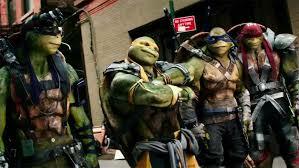 -The turtles are slimmed down so that they are not huge. They are still big, but not steroids big. -Gone is the sexual humor, especially from Michelangelo. I found that to be really weird in the 2014 film and am glad that they got rid of it. -There is a chase early on in the film that is really well shot and exciting. 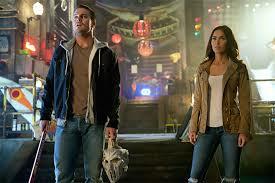 The filmmakers brought in the turtle van and use it to good effect. It is a shame that we never see them use it again. I can not say that I hated this film. I thought that the film was ok. It tried to be closer to the film that fans wanted and for that I will say that at least they tried. They, however, did not make a good film. There are some good things about this film, but there are way more things that the filmmakers did wrong. 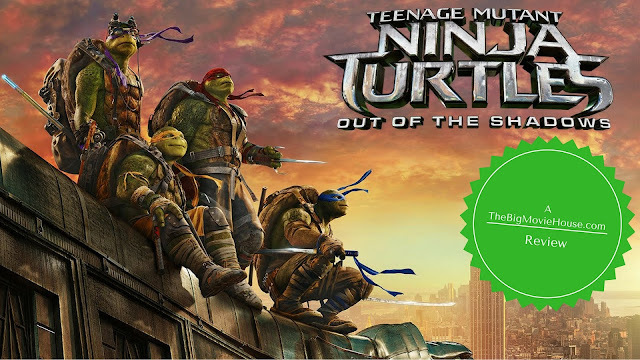 I can not recommend this film to anyone, not even to Turtles fans. Watch the show that is currently running on Nickelodeon. That show nails everything they include in the show.